1) New product Community, based on Chatter technology, will become the bedrock of external facing customer and partner on-line communities. This will not only have the effect of replacing old portal products, but also make external facing CRM functions to be more social, and for business create avenues for generating new revenue streams. 2) Work.com, a major area of investment for Salesforce.com, aims to transform how work is organized and managed by present day businesses. A tight integration between Work.com with CRM applications could increase the productivity and effectiveness of sales/marketing/service operations. 3) Radian6’s which SFDC acquired last year is gaining lot more teeth with more integration with other SFDC assets -in the process the Marketing cloud story gets more powerful, potentially tapping the multi-billion business potential therein.Through Buddy Media, Radian6, and CRM platform integration, Salesforce.com offers a product differentiated through its breadth of features. 4) The Service Cloud console is getting more and more powerful with lot more focus on making it broad based and feature rich. It’s now clear that Service Cloud’s social and mobile focus will certainly position it to capitalize on a large market opportunity and develop into a large business. 5) Salesforce Touch, and Data.com, Social Key: Salesforce Touch, powered by HTML5, expands on salesforce.com‘s native mobile strategy and will bring Salesforce to any mobile device—this is regardless of platform—and empower sales to collaborate on deals anytime, anywhere. And Salesforce Data.com Social Key will unite the best context from social networks with traditional company data, enabling enterprises to build stronger relationships with customers and close more deals, faster. 6) Salesforce Chatterbox: Salesforce Chatterbox will deliver simple and secure file sharing across any device with the proven trust of Salesforce. With Salesforce Chatterbox, people will be able to manage and share files in the context of their business. Chatter based Communities for customers and partners It may be noted that Chatter( aimed at facilitating internal employee collaboration) has achieved significant adoption since launch two years ago with a little less than 200K company networks till date. It appears that SFDC is leveraging Chatter technology to enable more of customer and partner facing functionalities. Along came the announcement that a new product called community will be launched in summer of 2013 that will power various online communities for customer service, channel partner collaboration, marketing engagements and enterprise sales execution. Chatter is now broadbasing its role by essentially becoming the platform technology that infuses various external facing CRM business processes. The new Community product will replace the old customer portal or partner portal products – a big shift appears to be in the offing here. Although so far Chatter has primarily been used as a tool to increase the customer engagement with CRM apps, with this announcement of Community, It’s also clear that Salesforce.com will take the next big step of directly monetizing the Chatter technology with separate licensing. Chatter is indeed making the entire CRM function to become more social and collaborative for all participants–customers, partners and employees. Work.com is focused on transforming how work is organized in modern companies Rypple is now rebranded to Work.com to reflect the broader mission of re-inventing how work will be organized and managed in companies in the future. Instead of hierarchical org chart with command and control style management, as seen in traditional enterprise software implementations, Work.com professes a different approach that is based on organizing people in flexible workgroups and networks that are more conducive in accomplishing goals and tasks. Today, Salesforce.com claims that it has already adopted Work.com among its multi-thousand employees to enable a more network based organization with better goal setting and collaboration, continuous feedback and performance recognition, and claims to have reaped positive returns in the form of increased sales productivity. The close integration between Work.com with CRM applications could also increase the productivity and effectiveness of sales/marketing/service operations. Work.com is one of the key investment areas at Salesforce.com, and it is clear that Salesforce.com can build out the service to be yet another significant business segment over time. The Big One : Marketing Cloud As per data shared by SFDC, currently 65% of marketers feel pressure to improve social media effectiveness, and 48% feel pressure to report quantified outcomes of social media marketing. SFDC has correctly sensed that this will be a big area of focus for enterprises to invest appropriately and reap returns. Marketing Cloud is well positioned to address these top concerns by marketers. Marketing Cloud ties together some existing Salesforce products and delivers the key outcome that businesses need in the social age – the ability to both measure, and react to external social influences. The story here is that when marketing cloud is enabled along with the monitoring aspects of social and when tied to actual workflow and automation, Salesforce provides a end-to-end solution that will lower the barriers to entry into the social realm for its enterprise customers. Through the Buddy Media and Radian6 integrations, the Marketing Cloud offers a more comprehensive product – enabling both creating marketing content and mining marketing intelligence data, all integrated with the core CRM platform. This is a powerful combination when it works effectively for enterprises. Radian6 enables enterprises to keep an active pulse on customer sentiment and use data to drive launch and content strategy. Radian6 can generate reports including volume, geographic location, age/gender demographics, word cloud charting, and volume of positive and negative social comments. The Integrated functionality can help enterprises respond to social media mentions across a variety of channels from a single operating platform. If cases get raised through the CRM, they can be automatically routed to relevant departments such as sales or customer service depending on key words/taggs/attributes in the social post. This integration is a key differentiator for the Marketing Cloud, creating synergies across CRM’s product portfolio and broadening the product footprint. Service Cloud : Adoption on the rise Service Cloud is well positioned to become another mega business over the next several years. The product itself is getting better with tine and with a number of success stories around the world, this is only gaining huge momentum. One of the most notable feature is the third party application integration, as it allows a company to incorporate in-house or industry specific applications in the Service Cloud interface, dramatically expanding the reach of the application. The most powerful part of service cloud : Integration across multiple channels (web chat, email,phone, video) permitting cases to be managed across various channels in an integrated manner. The social dimension kicks in here with the launch of features like live news feed – these can push urgent notifications from multiple sources directly to the agent, empowering the agent much more in the process. Integration with Radian6 also allows rapid response to social media posts on Facebook, Twitter, and other social media channels. Like in every other part of SFDC product spectrum, the emphasis on mobile and tablets were clearly seen as coming – and SFDC highlights that the interface experience through tablets would be identical to the desktop experience – an important one as multiple types of tablets are enabled within the larger SFDC platform. Salesforce Touch Experience Salesforce touch delivers on Salesforce’s long opined perspective that the future will be delivered over multiple devices and in multiple contexts. They were arguably the first company to really recognize the enterprise value of the tablet, and touch will enable their customers to deliver highly contextualized applications to their staff and stakeholders. Similarly with Chatter Communities we see Salesforce spread a fabric of social engagement outside of the organization itself and create continuity across the spectrum of customer to vendor touchpoints. And Data.com Social Key simply allows the organization to move away from the current paradigm where enterprise contact data is seen as distinct from external contact data – rather the two things will be merged into one global contact – the way most of us work in our day to day lives. • ChatterBox enables content to be deeply embedded within an enterprise application and ChatterBox does this. As it can be seen, content is an integral part of core workflows and processes and not something in and of itself. Well evolved deep integrations of third party applications can be a very compelling model for content management, but a native product brings with it huge advantages. • The new Salesforce Identity will deliver “Facebook-like identity for the enterprise,” a single, social, trusted identity service to access and centrally manage every cloud app. With nine major enterprise cloud platform services, companies can now accelerate innovation and deliver next generation social and mobile apps with unparalleled levels of speed, mobile and trust on the Salesforce Platform. • Heroku integration with the Salesforce assets will now be enabled through the newly developed identity that works across all Salesforce assets as well as integrate across clouds – in a manner similar to Active Directories within the enterprise but the scale here can be really much large. • Shift from transaction to engagement. CRM traditionally focused mostly on the customer management, and later evolved to cover functions like relationship, service etc. Shift forward to engagement strategies point to a move towards bi-directional conversations, unstructured information, and models of influence. • The distinction between consumer and enterprise is slowly melting away – In other words the consumerization of the enterprise is becoming more and more real. • The emergence of customer experiences. CRM/Front office system’s typically covers SFA, marketing, service, eBusiness. Integrated customer experience is a reflection of aligning the front office and back office functions to provide an unbeatable customer experience. Salesforce.com is attempting to address all the components here that make up the fabric here. Seen from that perspective .With so may well thought out improvements and enhancements, Salesforce now has all the ingredients to become the enterprise nerve center – after all, enterprises want to make all part of the organization to be ready and work in tandem to respond to business needs and here SFDC provides a wide coverage and should therefore become more and more critical to the business teams. Global Vice President & Business Leader - Digital Experience & Marketing, Collaboration, Content and Social lines of business for HCL Technologies. He has led international teams and initiatives for large enterprises and leveraging digital technologies to create change, focused on enabling new client experiences, creating new customer markets, & fragmenting markets to destroy existing value chains, by working with clients to shift value within and across industries, change the nature of industry control points, & redefine how work is done. 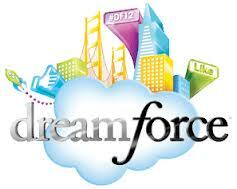 You’re totally right, Salesforce has made some impressive announcements during Dreamforce ’12. How have you enjoyed this event on a personal note?